Parents with young children know how important it is to child-proof their homes. They also know how quickly a situation can go from safe to out of control in a matter of seconds. Our little ones are explorers! They are adventurers! Risk takers by nature! That’s why it’s our job to do everything we can to child-proof and mitigate risk whenever possible. From curtain cords to electrical outlets, it only takes a second for everyday objects to become a danger. When parents look to secure their home, they typically head straight for the bathroom and kitchens. Of course! That’s where my mind first goes as well. But one place is often left untouched – and that’s the laundry room. Laundry packets are becoming more and more popular. Personally, we lean on this method in my home and because of this, I have to be extra careful about where I store my units. Did you know that since packets are concentrated and designed to dissolve in water and contain highly concentrated detergent? While not a problem for older kids or adults, it is for young children – especially kids who are one and two years old, who explore much of the world through their mouths. These laundry packets can potentially be harmful if punctured or ingested. It’s important to keep this in mind. Tide wants their consumers to be aware of these risks and to stay on top of the latest news and technology in the laundry space. Because of this, they’ve launched an educational campaign in conjunction with Safe Kids Worldwide, The American Cleaning Institute, and The American Academy of Pediatrics. I’m so happy this is happening because knowledge is KEY! 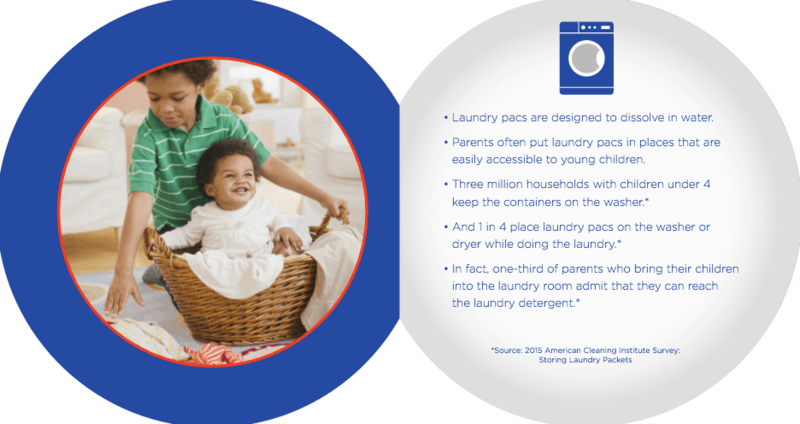 First and foremost, Tide wants all households to remember to keep their laundry pacs UP and CLOSED so parents can keep their children safe. This graphic is so important to remember and so simple to follow. If our children don’t have access to the laundry packets, then there is no way that they can place them in their mouths or near their eyes. 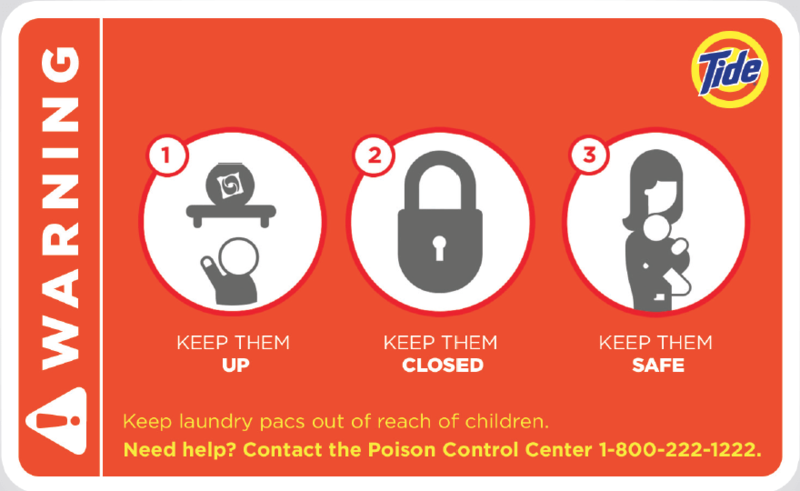 As a reminder, if you ever have a question about laundry packets, or if something happens in your house that you need guidance on, be sure to call 911 if it’s an emergency or call Poison Control (1-800-222-1222) for more assistance. Please, right now, stop and plug that number in your phone. It’s so important. Much like many other household cleaning products, laundry packs need to be handled with great care to prevent unintended exposure. Here are 5 tips to remember when working on baby proofing your laundry room. Keep laundry products out of the reach of children at all times – even between loads. Never place a laundry packet on the top of a pile of dirty laundry. They should never be outside of their container and accessible to children. Use a cabinet safety latch as an added security measure to ensure products are not accessible. Keep all laundry out of reach. After each use, close the container completely and immediately put products away in their appropriate storage location. If your child does put one of these packets in his mouth or gets any in his eye, call Poison Help at 1-800-222-1222 immediately. 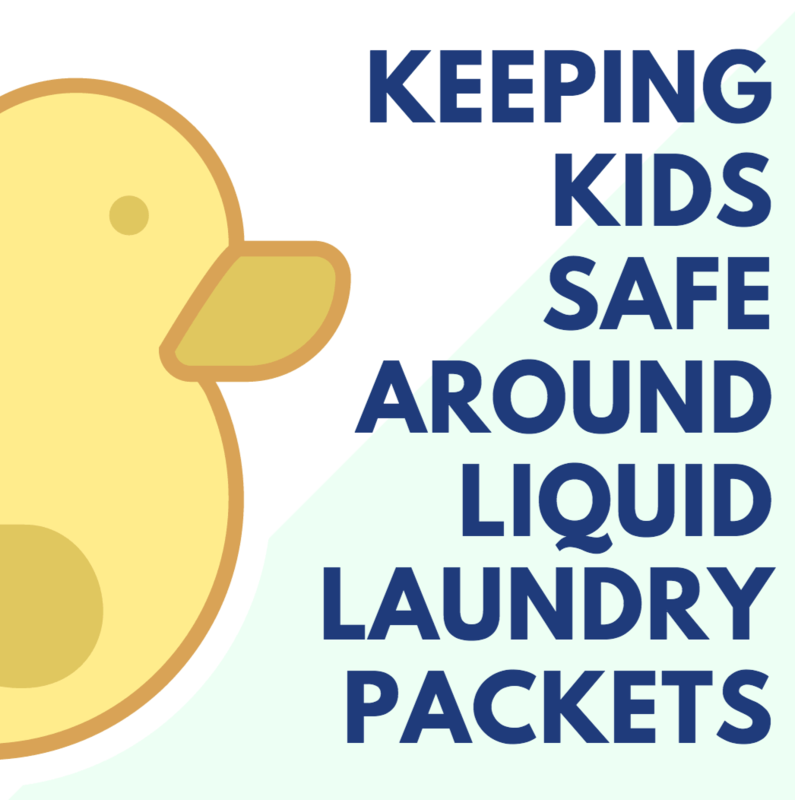 For additional information on laundry safety, please visit the AAP’s org or SafeKids.org. I’d like to also invite you to watch and share the Tide Television Commercial “It Only Takes A Second” with other parents and caregivers. I’ve included it below. I think it’s a great video.